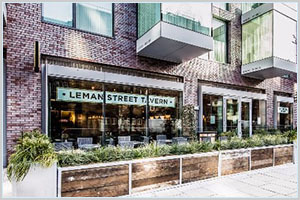 Leman Street Tavern | Pub Quizzers | Find a pub quiz near you, now. Pub quizzes take place at Leman Street Tavern, Aldgate on Sundays (occasionally) at 22:00. Entry is £10.00, you can have up to 2 people on a team. There are prizes of drinks. Happy quizzing! This quiz no longer takes place. Please attend our quizzes at the Colonel Fawcett, Simmons Soho or Sir Colin Campbell instead. Check @CompleatQuiz for the latest news Tell Us More About This Quiz!